I hope you will contiue to enjoy what we have to offer on these pages. I would still like to here your views and comments on how to improve the site. Do you have any old photographs of our viecles if so then please post them to us and we will publish them on this web site with full credits given to the photographer. To enlarge the pictures just give em a click. We require a front Grill for 951UVT. Does any one know where we can either purchase or have one made please contact via e-mail. 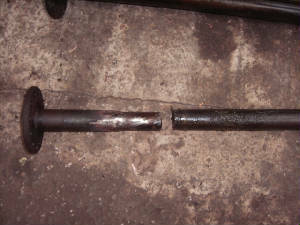 floid brake system. Philip will be weaging the job soon to sontinu working on ths garden so I will get back to the bodywork. 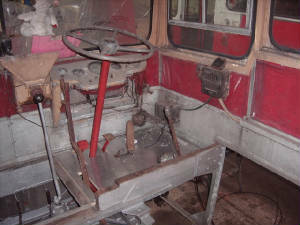 A complete restoration working plan on the Bedford is now being worked out, once again Philip will be taking an active part in the restoration. The plan is to split the body from the chassis from the body again and to put the body under wraps outside the barn while the chassis is fully restored. First job will be to fit four new body mounting brackets so we can tow the bus outside. We are making plans to make an application for lottery funding, we should be able to meet the conditins set by the commission the only stumbling block will be we that will have to go through an organization with charitable status. We have startes to exlplore the possibility of lottery funding to enable the restoration of 951UVT to continue,without it the estoration will dontinue but at a buch slower pace when funding allows. The Bedford's restoration has suffered allot over the last few years due to other projects taking priority so help is now urgently neesed. 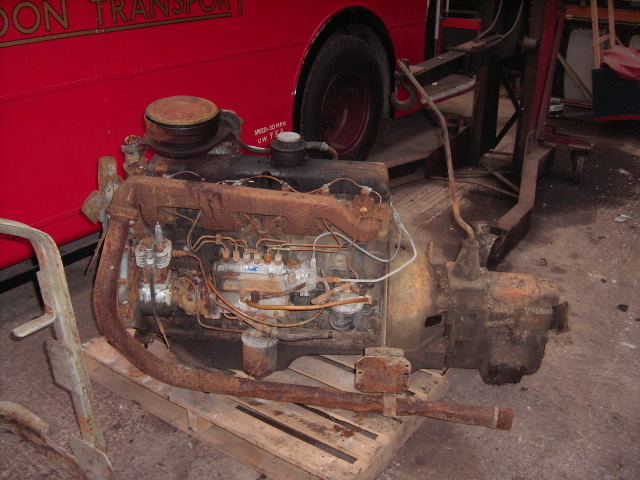 I am going down to Shobdon angain this weekend looking for more bits for the Bedford and my Commer. 1 Apr: Carnival of Transport, Coleford, Gloucestershire. Free Park & Ride. 1 Apr: Brijan Tours Charity Open Day, The Coach Station, Bottings Industrial Estate, Curdridge, Southampton. Click here for an entry form. 1 Apr: Electric Transport Celebration, Ipswich Transport Museum, Suffolk. 6 Apr: Morpeth Gathering Park-and-Ride from County Hall. c/o Aycliffe & District Bus Preservation Society. 6 Apr: South East Bus Festival 2013, Kent Showground, near Maidstone. Including 60th anniversary of London Guy GS class. By the organisers of 'M&D 100' and 'M&D and EK 60'. More information here. 6 Apr: Barnet Transport Fair, Christ Church Hall, St. Albans Road, High Barnet EN5 4LA. 7 Apr: Bus & Coach Preservation Spring Transport Fair and Running Day, Leisure Centre, Civic Centre Road, Havant, Hants. 02392-655224. 7 Apr: Copelands of Meir Big Cats (Independent Bus Tours). Enthusiast trip featuring rides on 4 Leyland Tigers plus 2 other vehicles. 7 Apr: ** EVENT CANCELLED DUE TO WATERLOGGED FIELD ** Bustival, at Isle of Wight Steam Railway, Havenstreet, c/o Southern Vectis (Go South Coast). 7 Apr: A2Z Spring Road Run, start/end at Warminster, Commercial Transport in Preservation. 7 Apr: Bristol Vintage Bus Group Mini Running Day from Brislington. 11-14 Apr: Great North Steam Fair, Beamish, County Durham. 13 Apr: "The Hodsons Hurrah", enthusiast trip from Blackburn to Hodson's Coaches of Clitheroe. 13 Apr: Keighley Bus Museum "Go Local Sunday". Town Tours on board a free heritage bus linking all the town's 22 visitor attractions. 14 Apr: LT Country Bus Rally, East Grinstead. 14 Apr: Trip to East Grinstead Bus Rally (see above) from Doncaster, Rotherham, Alfreton and Derby. 14 Apr: Aston Manor Road Transport Museum, Open Day, Shenstone Drive, off Northgate, Aldridge, nr.Walsall WS9 8TP. 14 Apr: South Yorkshire Transport Museum, Open Day and "Transport Model Day" at Aldwarke premises, Rotherham. 20 Apr: Theydon Bois Transport Bazaar & Bus Running Day, Theydon Bois Village Hall (opposite village green). No car parking at village hall. 20 Apr: "Mid-Cornwall Basher", enthusiast trips around Cornwall using Roselyn Coaches Olympians, from Roselyn's depot in St.Blazey Road, Par. Email for details. 20-21 Apr: UK Coach Rally, Alton Towers, Staffs. 20-21 Apr: Colne Valley Railway Vintage Vehicle Weekend, Castle Hedingham, Essex 01787-461174. 21 Apr: 40th Spring Bus & Coach Gathering (formerly the Cobham Rally), London Bus Museum, Brooklands, Surrey. 21 Apr: Enthusiast trip from Nottingham to the London Bus Museum Gathering at Brooklands (see above). Day trip leaving Nottingham at 7am and returning at 5pm. Call Callum on 07411-870898 or email. 21 Apr: Classic Cars & Vintage Vehicles, Burwell Museum, Cambridgeshire. 21 Apr: National "Drive it" Day, Federation of British Historic Vehicle Clubs. 21 Apr: Penzance Bus Running Day, supporting the Cornwall Bus Preservation Society, routes from Penzance Bus Station to Lands End, St Ives, St Just, Perranuthnoe, Marazion and Mousehole. 21 Apr: Road Transport Event at Nottingham Transport Heritage Centre, Ruddington. 21 Apr: Teesside Vintage Bus Running Day, based at Middlesbrough's Transporter Bridge. 01642-782796 or Email. 21 Apr: Enthusiast excursion to Teesside Vintage Bus Running Day (see above) from Doncaster, with train connections from Sheffield and Leeds. 21 Apr: Sandbach Transport Festival, Cheshire. 27 Apr: Irish Transport Heritage Bus & Coach Rally, Ulster Folk & Transport Museum, Cultra, County Down. 27 Apr: Harpurs of Derby Running Day, enthusiast visit from Chesterfield and Alfreton. 27 Apr: Maidstone Vintage Toy Fair, Lockmeadow Market Hall, Hart Street, Maidstone. 27 Apr: Grey Cars of Torbay Centenary Open Day, 1100-1600, Daneheath Business Park, Heathfield, nr Newton Abbot TQ12 6TL. 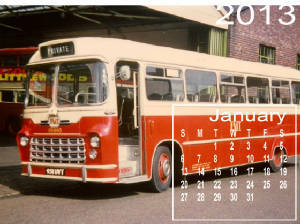 Display of historic coaches with free shuttle bus link from Newton Abbot rail & bus stations. Email or phone 01803-857106. 27-28 Apr: 1940s Weekend, Dover Transport Museum, Whitfield, Kent. 28 Apr: South Devon Classic Coach Road Run from Newton Abbot and Torbay to Dartmouth to celebrate Grey Cars of Torbay Centenary. Email or phone 01803-857106. 28 Apr: Wheel Nuts 2013 (charity classic transport show), St. Roses School, Stratford Lawn, Stroud, Gloucester. 28 Apr: Bude Classic Motor Show, Rugby Ground, Bude, Cornwall. 28 Apr: Charity Bus Running Day, Route 251, Southend to London. 28 Apr: Bristol Harbourside Bus Rally & Running Day. 28 Apr: Classic & Vintage Ford Day, Ford cars, buses, trucks and tractors. British Commercial Vehicle Museum, Leyland, Lancs. 28 Apr: History in Motion, East Anglia Transport Museum, near Lowestoft. 01502-518459. 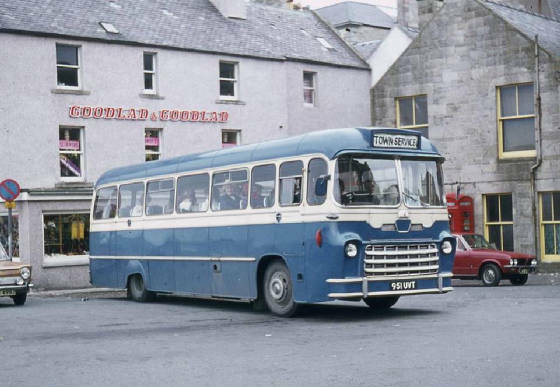 30 Apr: Independent Coachways 2nd Annual Reunion and nostalgic evening. Fleece Hotel, New Road Side, Horsforth, Leeds. Starts 7:30pm. 0113-236-3695 or Email.